Temperature monitoring in Canada indicates a warming of shallow permafrost over the last two to three decades. 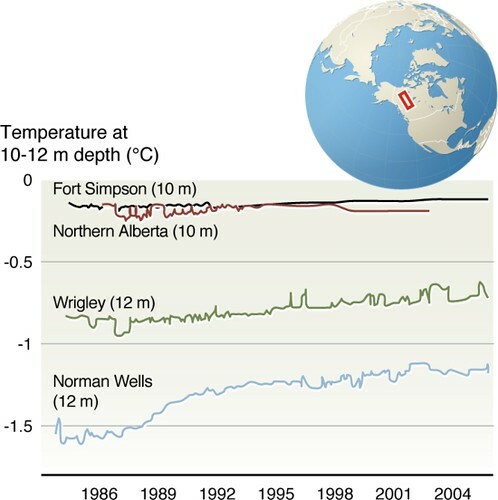 Since the mid-1980s, shallow permafrost (upper 20-30 m) has generally warmed in the Mackenzie Valley. The greatest increases in temperature were 0.3 to 1°C per decade in the cold and thick permafrost of the central and northern valley. In the southern Mackenzie Valley, where permafrost is thin and close to 0°C, no significant trend in permafrost temperature is observed. This absence of a trend is probably due to the fact that this permafrost is ice-rich; a lot of heat is absorbed to melt the ice before an actual temperature change occurs. A similar lack of temperature trend is found for warm and thin permafrost in the southern Yukon Territory.